The history of invented languages told in this book, edited by Michael Adams, ranges from the philosophical languages of the seventeenth century to modern creations linked to books, films and games. The story of the international auxiliary languages such as Volapük and Esperanto — created with high moral purpose to aid communication between peoples lacking a common tongue — take up only one chapter of this book. The emphasis is rather on languages of various levels of completeness that have been created in the past century to add a sense of place and culture to creative works. Some are long-established, such as J R R Tolkien’s Elvish languages Sindarin and Quenya, well-developed tongues created by a linguistic scholar that are woven into The Lord of the Rings. George Orwell created Newspeak in his 1984, a regularised and pared-down English designed to make it impossible to even think anything that didn’t conform to the beliefs of his dystopian state. In A Clockwork Orange, Anthony Burgess used Nadsat, an argot based on Russian, to characterise the worldview of the book’s violent gangs. Followers of the Star Trek SF franchise will have encountered the Klingon tongue, originally a few phrases introduced to give colour but later worked up by Klingonists into a tongue in which it’s possible to perform Shakespeare. A more recent case is Na’vi, the speech of the natives in Avatar. The rise of computer games has led to several languages — mostly only partially developed — that include Gargish, D’Ni, Simlish, Al-Bhed and Logos, to help provide a flavour of the culture of groups being portrayed. Michael Adams’s academic contributors offer a very mixed bag of eight chapters in which these and other languages are discussed in detail. The last, by Suzanne Romaine, takes a different line; she investigates natural languages that have been revitalised in recent times, including Hawaiian, Irish, Breton Cornish and Hebrew. She points out that to bring a dead or dying tongue back to daily use requires many decisions to be made, not least how it should be said and spelled and how words for aspects of modern life — aircraft, telephones, antibiotics — should be created. The potential for splittist factions who compete to gain ownership of a language is always present; Cornish has several, which led in 2004 to the county offices in Camborne trying to accommodate all parties by using four different spellings of the Cornish word for welcome in different places within the building. Trying to build the consensus essential for widespread take-up of a language in such circumstances is very difficult. This work will give readers with a serious interest in invented and revitalised languages a good grounding in the issues involved. If you would prefer a more popular approach, Arika Okrent’s In the Land of Invented Languages may be more to your taste. 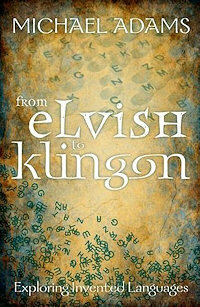 [Michael Adams [ed], From Elvish to Klingon: Exploring Invented Languages; Oxford University Press; published 24 Nov. 2011; pp294, including index; ISBN 978-0-19-280709-0; publisher’s UK price £12.99.